For the 2006 UK tour of the Rocky Horror Show, the merchandise has been nicely updated with some items that we've rarely seen before. 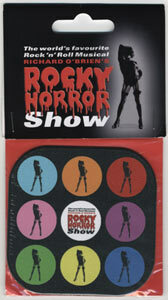 Another of these items is the Rocky Horror Show branded Drinks Coasters. These are printed with eight silouette "Frank" logos as seen in the downloads section of rockyhorror.co.uk as well as the main show logo. You get two Coasters in each pack and they measure 95mm x 95mm (3.5 x 3.5 inches) in size. Currently only available to buy at the Rocky Horror UK stage show venues during performances, the Coasters are £2 per pack. Your chance to place something hot on Frank?